As a company on the forefront of environmental monitoring technology, our goal is simple: create products that our customers love and make new technology and innovations available that improve the user experience. We'd like to introduce AcuRite Access, which enhances the way you store and share your weather data. 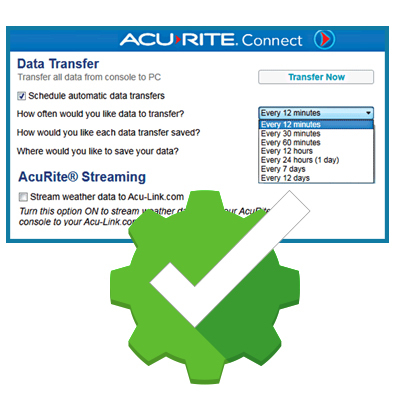 Unlike the PC Connect product, AcuRite Access eliminates the need to have a dedicated computer running 24/7 to upload your data to My AcuRite and Weather Underground. AcuRite Access also allows you to connect multiple sensors to your My AcuRite account, such as indoor conditions, leak detection and more, to complement your 5-in-1 and provide a comprehensive monitoring solution in and around your home. Learn More about AcuRite Access. Store, track and share weather station data. With PC Connect you can log weather history and monitor trends with detailed weather records measured by a wireless sensor right in your backyard. 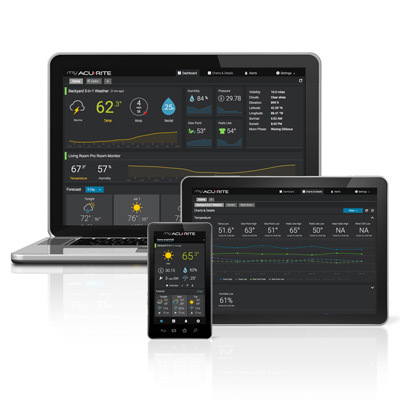 View home weather conditions from anywhere on a PC, web browser, smartphone or tablet. Weather station display with data logging and streaming capabilities. 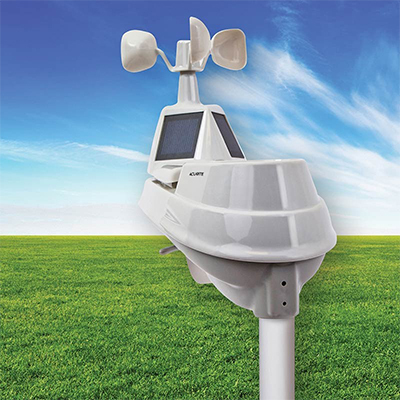 AcuRite weather stations with PC Connect can be used as a standalone weather station, can transfer data to a Windows PC, and can stream your weather online to websites like Weather Underground or My AcuRite. Works with 5-in-1 and PRO+ 5-in-1 Wireless Weather Sensors. AcuRite’s professional 5-in-1 weather sensors accurately measure five different conditions including the outdoor temperature and humidity, the wind speed, wind direction, and the amount of rainfall. Totally wireless with an efficient 2-year battery life. Save and analyze your weather data on a computer. 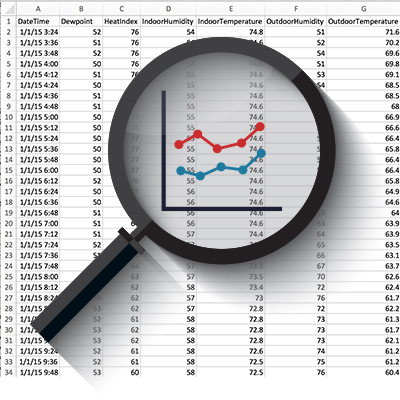 Keep a log of your weather readings by downloading the PC Connect data file with your weather records right to your computer’s desktop. Analyze your data and monitor local weather trends with detailed weather records. 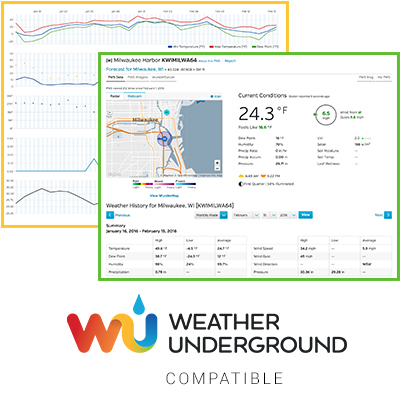 Featuring Rapid Fire updates on Weather Underground. Easily stream your weather data online – with just a few clicks you can report your weather on personal weather station (PWS) networks. Includes out-of-the-box compatibility with the My AcuRite website and mobile app, or broadcast on Weather Underground’s Wundermap using rapid fire updates (sharing data every few seconds). AcuRite's PC Connect boasts a quick and easy guided installation that allows you to download data instantly, schedule downloads and share your weather online within minutes. Its remarkably intuitive interface delivers the best-in-class user experience you expect. Check the weather at home while you’re away. Get peace of mind about the conditions at home while you’re at work or travelling. PC Connect can automatically transfer your weather data to the My AcuRite application, allowing you to monitor environmental conditions remotely from any web browser, smartphone or tablet. Windows 10 / 8.1 / 8 / 7; 1.6 GHz or higher processor, 1 GB RAM (32-bit) or 2 GB RAM (64-bit), Available USB port. 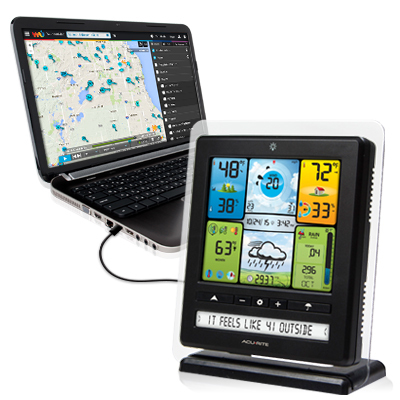 AcuRite's PC Connect is the ultimate weather station software.